It’s been polling day here today. Not for national government, but for our local councils. So it’s the time when people who might have been doing quite a good job, get a thorough kicking because of unpopularity at the top. This year, two parties are up for a drubbing because we have a coalition, so if Labour doesn’t do well, Ed Miliband should really pack up and go join his brother in political limbo. We’re also voting this time in our first referendum since 1975. Then, it was about joining or not joining the European Economic Community (we joined). This time it’s about Alternative Voting (AV) as a replacement for the First Past the Post system we’ve had forever. Pretty important stuff. 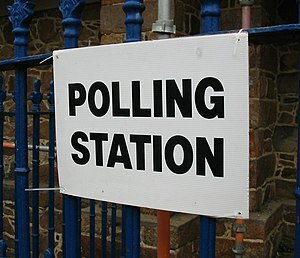 Our polling station is in the village hall so I took myself off down there late this afternoon and got in the queue. Well, the part up to ‘queue’ is accurate. Actually, the place was deserted apart from two women sitting by the door with clipboards; and three looking like magistrates and sitting at trestle tables opposite a trio of wooden booths. I was tempted to invent a scene in a horror film and shuffle round the walls making starey eyes; or mime elbowing the crowds out of my way, but plumped for one of those walks people do when unexpectedly called to centre stage. Thus was the democratic process initiated. I made my mark on pieces of paper with a stubby pencil on a string. I exited stage left. So its goodnight from me; and it’s goodnight from him. Some things appear to be quite similar on either side of the Atlantic. Thanks for a grin. I don’t think the Lib Dems are grinning this morning; they seem to have got the mean end of the national thumping. In fact, the only winners seem to be the Scottish National Party which might suddenly find it’s got Scotland to itself! Look out for satellite pictures showing a huge saw hovering over Hadrian’s wall! My aunt may have to emigrate; I don’t see her queuing for a Scottish passport!